Add a classic piece of furniture to your garden with the Bavarian-styled Harriet Table, comfortably seating up to 6 people. The table's curved design is made from pressure treated wood, providing the piece with a smooth and natural finish. 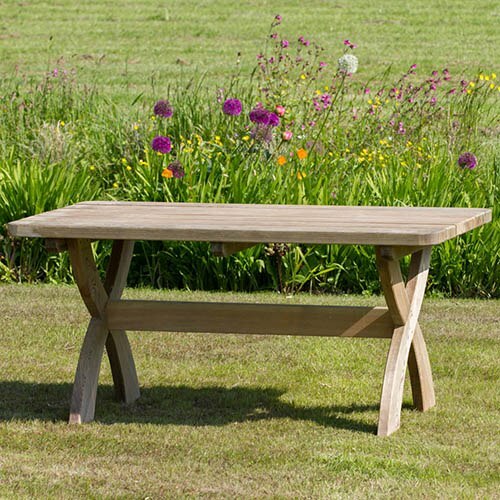 The Harriet Table is manufactured from high quality, pressure treated, FSC® Certified timber to last longer, and comes with 10-year guarantee against rot so you can be sure that this product will last the test of time and remain a beautiful feature in your garden. Dimensions: 1.60m x 0.756m x 0.75m, assembly required - This product is 2-person assembly. IMPORTANT: This item is delivered directly by our third-party supplier. Note, a valid mobile number and email address are both required to deliver this item. Please provide these when you place your order.